We've been making plenty of reference to the milestones being knocked off by Aussie brewers in recent months. 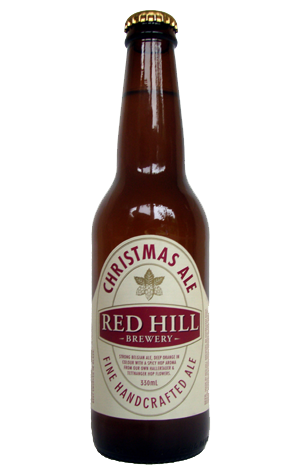 And now the country's first Christmas Ale (at least of the contemporary era – maybe there were others back in the dim and distant past) is notching up its ninth vintage. Like Red Hill stablemate, the Imperial Stout, it's a beer that has not only stuck around but has remained resolutely untweaked and much loved to boot. For the uninitiated, it was one of the beers designed in the Mornington Peninsula brewery's early days alongside Belgian beer specialist Ben Middlemiss, a Kiwi brewer and friend of the Goldings. What that translates to is a hazy, rusty copper coloured beer with a big, fluffy white head from which all manner of Belgian yeast goodies (and some malt aromas) pour forth: banana; marzipan; cinnamon; nutmeg. It's soft on the palate, missing those spices and toasted caramel malts with a drying spicy finish. And, being a Christmas time treat, more than a little boozy warmth.